Ketosis is the state when you have an elevated level of ketone bodies in your body. Ketone bodies are naturally formed ketogensis when the glycogen stores in the liver are depleted. Ketone bodies acetoacetate and β-hydroxybutyrate are used by the body for energy. It is easy to get confused with the term “ketosis”. Some people believe it is a dangerous state for the body. The main meaning of ketosis is that the body is using fat as a energy source. Ketones is the molecules that are generated during the fat metabolism. This either from the fat food you just ate or from the body fat. The Ketosis state can be achieved by changing your diet from a diet with a high level of carbohydrates to a diet that is low with carbohydrates and high with fat and proteins. The main reason is to not provide sufficient carbohydrates to replenish glycogen stores in the body. When this happends the body goes to ketosis. When the body is breaking down the body fat for energy, most of it directly converted to ATP. There is also ketones produces in this process due to that the body has changed to use fat as energy source. The acetoacetate and ß-hydroxybutyrate ketones are used for energy. As an example the heart muscle and kidneys prefer ketones over glucose. The brain cells are also able to use ketones for at least part of their energy. One way to detect if in a state of Ketosis is your urine which can be checked by using a dipstick commonly called Ketostix. This detection in the urine is what is commonly called “ketosis.” A higher concentration of ketones in the urine will make the sticks turn more purple. 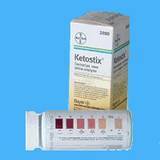 Some diets like The Atkins diet advise people to on a regular schedule monitor their ketosis levels. During the first stages of the Ketosis process the blood glucose levels are held through gluconeogenesis. The adult brain does not burn ketones in this state. Instead the brain instead makes use of ketones for lipid synthesis in the brain. After roughly two days of the Ketosis process the brain changes its fuel and starts using ketones for energy.